Big chunky cables in contrasting colors run down the front and back of these socks. 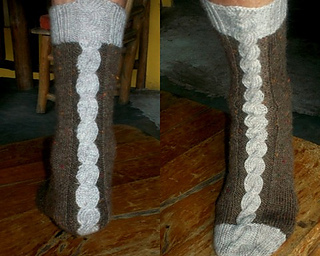 The two color technique is an intarsia-in-the-round method which leaves no stranded yarns on the wrong side of the fabric. The heel construction is the traditional flap & gusset method with your choice of a plain heel or to bring the cable all the way down to the end to show off when you wear open backed shoes. Instructions are given both in charts and written Line-by-Line.